Resorts World, the very first casino to be located inside the Big Apple, opened its doors on Oct. 28, 2011. 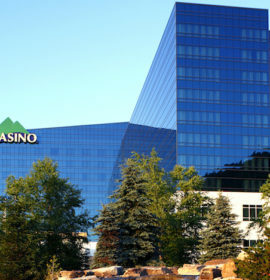 It is not technically a “casino” but a racino, a racetrack licensed by the state to operate slot machines, or rather electronic gambling machines, on its property. These electronic gambling machines are more than big video consoles, however. Some, such as the baccarat machines, have actual robotic arms dealing real cards. No other racino has such machines. The Aqueduct Racetrack is a late comer to the racino party in New York state. Other tracks, such as Saratoga and Tioga Downs, installed video gaming some time ago. Resorts World Casino NYC is divided into three levels, named “Times Square Casino Level” on the ground floor and “Fifth Avenue Casino” upstairs, but of course they’re part of one casino. The third level is called “Central Park” and is a vast events area available for weddings and more. Not precisely green space but perhaps as close as it comes within a gambling house’s doors. After all, Times Square level has 2,200 slot machines, from penny slots on up. And the Fifth Avenue level is crowded with 2,245 slots and over 260 electronic table games. Resorts has a private High Limit Gaming section called Crocksfords Casino, with a view of the racetrack. Near to hand is the Palm Beach Lounge. As with any casino, it’s definitely recommended you get a casino rewards card. The RW card immediately gives you a discount on show tickets, a 10% discount in the stores, and there are occasionally parking specials offered even to a member at the starting level. As you play, your points are tallied and keep giving you perks as you go along. Right now Mondays are promotional days, from 10 to 10 you get a bonus of $5 to $100. For entertainment, visitors can go to Bar 360 for dancing, live entertainment, and a massively big 16-by-28-foot HD TV for sports. The calendar of Resorts World’s entertainment lists mostly the nightly dances. Concerts by big names are fewer than you’d expect in the heart of NYC. But perhaps that is because big shows aren’t so necessary — as they are to other casinos — to draw visitors to the city’s only casino. Because it’s New York City, you should expect the dining choices at Resorts World to be exceptional. And they are. First, there’s the Food Court. For quick food and snacks while you’re enjoying the games or entertainment. Includes some very simple but tasty treats from: Popeyes (spicy New Orleans style fried chicken), BBQueens (barbecued ribs, pork, brisket), Wolfgang Puck Express (fast but gourmet-level pasta, pizza and salads, accompanied by wine & beer), Good Friend Noodle House (fabulous oriental soups, dim sum, noodles, rice dishes), Queens Burger (fantastic gourmet burgers), Stage Deli (Dagwood-height sandwiches), Cups N Cones at Starbucks, and MidTown Express (snacks, fast meals). Also, there’s a bar in the Food Court, with live music: Bar 360. It’s open all day from 10 am until 4 am. You can stop in almost the entire time the casino is open. The Aqueduct Buffet is an international smorgasbord-style (meaning: All you can eat) spread of great food from vegetarian specials to seafood, pasta, and fresh fruit as well as delectable desserts. Serves lunch and dinner all week. RW Prime can only be described as elegant. It is a steakhouse of high quality. It’s best to have a reservation when you plan to go. The menu is pretty big, with the various cuts of beef, lamb, veal, seafood. The beef is certified Angus and dry-aged (cold-aging is done only with prime cuts of beef), which makes for a wonderfully tasty and tender steak. They will cook it anywhere along the “done” continuum you want, from “shining a flashlight on a cow” to blackened in and out. That’s how confident they are of their meat dishes, that it’ll taste good. Besides the filet mignon and rib eye beefsteaks, there’s veal, rack of lamb with purple-raisin mustard, and rosemary chicken. Prices are also grand. We’re wondering about that $112 Snake River Rib Eye Wagyu Steak; does it make for a genetically perfect dinner? Maybe. They also serve fresh seafood dishes such as broiled or steamed lobster, scallops with bacon, black sea bass with bay and parmesan cheese. The Genting Palace Restaurant is a nod to its Asian roots, as the Genting corporation is part owner of Resorts World. This fine restaurant offers favorites like Chinese barbecue, Roasted Peking Duck, Crispy Duck, and all sorts of fried or steamed rice dishes. Its offerings are as plentiful as a neighborhood Asian restaurant, but of an exquisite quality you won’t find easily. Seafood dominates the Chef’s Recommendations, with abalone in oyster sauce, sauteed lobster, and fried prawns with milky sauce & crystallized walnuts as examples. There’s any number of greens dishes, and different tofu versions of meat dishes. The whole assortment of food on their menu presents a picture of delicate tastes along with filling meats and seafood. Resorts World Casino NYC, located in the most desirable commercial place in the U.S., looks to be doing big gaming business as time goes on.